Range-topping F-Type has lots more power than the Porsche, but is it as good to drive? The 911 Carrera S is a consummate all-rounder, but can its brilliant handling make up the deficit in power and aural drama? If you’ve done reasonably well at school, worked hard throughout your career and lived a good life, you’d probably still need to have won the lottery to be in a position to buy either of these cars. Let’s face it, even though they have aged a couple of years and have a few miles behind them, they’re still expensive luxuries that cost a small fortune to buy and run. However, there is a way that more regular people might be able to afford them. If you’re not planning to keep the car forever or own it outright, you might consider owning it using finance. Instead of one massive payment, you make a number of smaller ones for a year or so. this way, it can feel more like a rare treat to yourself after a significant birthday or upon your retirement. With that in mind, you’ll want the car that is the best to drive, reliable (you’ll want to be able to drive it as much as possible) and, most importantly, will hold onto its value the best. You’ll also want it to be an exciting experience, since that’s what driving a sports car is all about. On that front, the F-Type scores maximum points, with its thunderous engine tone and raw, muscle-car power. However, Porsche has been fine-tuning the 911 over its many generations and, while it is down on power compared with the F-Type, it is faster both on paper and in the real world. So this test is going to be a close one. A quick glance at the vital stats makes this seem like an unfair fight. 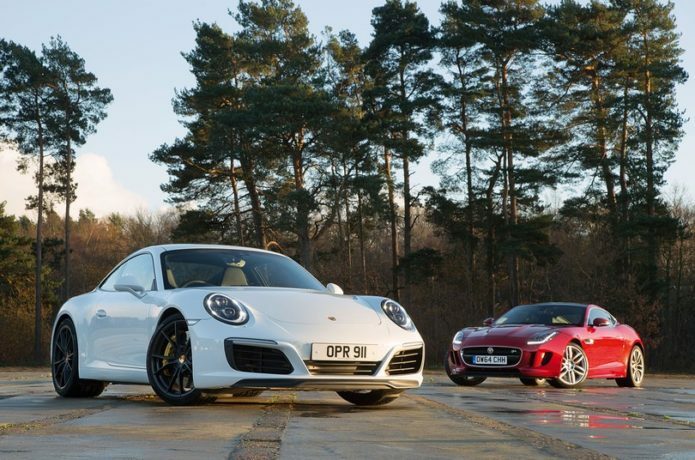 The F-Type has a mighty 5.0-litre supercharged V8 and 542bhp, whereas the 911 makes do with a comparatively tame 3.0-litre flat six turbo and 414bhp. That’s a bit like lining Tyson Fury up against Amir Kahn. Except it isn’t, because in the car world a lower weight almost always beats raw power, and the 911 weighs some 120kg less than its British rival. This, along with its faster-shifting automatic gearbox and superior traction, helps the car slingshot away from standstill, leaving the F-Type floundering as it struggles to transfer all of its power to the road. By 30mph, the 911 is already well ahead, and it passes 60mph in a barely believable 3.5sec. From 30mph onwards, the F-Type isn’t completely embarrassed, but continues to lose ground to its rival at a steady rate right up to the national limit. The Carrera S isn’t just fast, it’s savagely quick. In purely objective terms, then, this turbocharged 911 comprehensively beats the F-Type. However, because there’s no longer any point revving the flat six engine beyond 7000rpm (even though you can), you’re robbed of the enjoyment of doing so. The fact that there’s more pulling power at lower revs doesn’t quite make up for that. There’s also the noise. To the untrained ear, the 911 sounds much the same as ever, snarling at low revs and howling when you accelerate hard. However, it no longer screams as piercingly as its predecessor did when you rev the engine to its redline. If you’re an existing 911 owner, it’s something you’ll miss. Meanwhile, few sports cars at any price sound as good as the F-Type; its V8 roars when you put your foot down and the quad exhausts pop and spit angrily when you lift off the accelerator. It’s no contest through the corners, though. Turn the F-Type’s steering wheel and there’s a small pause before the nose of the car reacts – something that you simply don’t notice in the lighter and stiffer 911. The 911also stays flatter through twists and turns, and ultimately it’ll tear round bends at speeds that would have the F-Type sliding off the road. There’s still plenty of fun to be had at the helm of the F-Type on a twisty B-road, though, and the steering is quick and precise – even if it’s too heavy when you select Dynamic mode. The 911’s steering isn’t as quick, but streams a little more information to your fingers. The 911 rides on adaptive suspension (PASM) as standard, allowing you to stiffen the dampers by pressing a button on the centre console. However, our test car had optional lowered suspension that drops the ride height by 20mm and we found it was fairly abrupt over sharp-edged bumps. Wider experience suggests you’re better off with the standard set-up and enjoying a more comfortable low-speed ride; you’ll lose barely any cornering ability. The F-Type also rides on adaptive suspension but is always that bit more unsettled at low speeds. Gone are the days when living with a sports car meant constant backache. In fact, the 911’s interior is more comfortable and classy than most executive saloons’ – it has a brilliant driving position and there are seriously plush materials everywhere you look. Climb aboard the F-Type and there’s undoubtedly greater drama. Press the start button and heater vents rise from the dashboard, while a chunky central grab handle seems to fence the passenger off from the controls. However, start prodding some of the plastics and you’ll quickly realise they aren’t as lavish as those in the 911. The F-Type’s seats aren’t as supportive through corners, either. The F-Type’s touchscreen infotainment system is another triumph of style over substance. While it looks flash, it’s actually a headache to use, partly because it’s slow to respond to screen presses but also because of its overcomplicated menu system. The 911 gets Porsche’s new and improved infotainment system. You can control it using a rotary dial or by pressing the screen itself, but either way it’s quicker to respond and more intuitive. The F-Type is a strict two-seater, but while the 911 has a couple of rear seats, these are best reserved for baggage; adults simply won’t fit in them and even kids won’t relish a long journey. That said, Porsche will sell you an Isofix child seat that’s designed to slot perfectly into the sculpted rear seatbases. Better still, the 911’s rear seats can be folded down, opening up a flat ledge under the rear screen that you can use to carry a set of skis or golf clubs. That’s a good thing because the 911’s boot – in its nose – is too narrow and short for a big suitcase, although it’s deep enough for a couple of soft overnight bags. The F-Type, meanwhile, has a single boot in the usual place. It’s shallow but will swallow a set of golf clubs if you take out the woods and slot them in separately. There’s even a handy underfloor cubby for fragile items. Prepare to take a deep breath, because both of these cars cost a pretty penny to run. Let’s start with the prices. The F-Type is ahead here, because it has depreciated the most since it was new, meaning that even if you pay for the car in monthly chunks it is £1300 per month on a personal contract purchase(PCP) agreement, whereas the 911 is closer to £1900. The 911 is also more expensive to service, so you’ll need to take that into consideration. Fuel economy and road tax are better in the 911, though, with a combined figure of 36.7mpg and £230 road tax, compared with only 26.4mpg and £555 per year in tax. The F-Type is much more generously equipped. You get fully electric seats, cruise control, automatic xenon headlights and rain-sensing wipers, which were all expensive options on the 911. Then again, Porsche throws in dual-zone climate control, whereas Jaguar charged extra for that. Heated seats, front parking sensors and a reversing camera were also options. According to our latest What Car? reliability survey, Porsche finished ahead of Jaguar, with Porsche cars up to three years old finishing in 23rd place and Jaguar coming in at 28th out of 31 car brands. As the cars get older, significant differences emerge. Porsche cars over four years old jumped to seventh place in the league, whereas older Jaguars came in 20th. Here’s the big question: would you rather have the better all-rounder, the 911, or trouser a saving of more than £20,000 on the imperfect but exciting F-Type? Both are a good buy in their own right. The 911 makes the most sense for those who need an everyday sports car, because it is hugely practical with a deep boot in the nose, along with back seats that can be folded flat and used as a storage shelf. It’s also much faster in the real world than the F-Type, thanks to its immense grip levels, immediate steering and impressive road manners. Excessive road noise and a disappointing engine tone are the only major blots on its scorecard. That said, £20,000 is a significant chunk of change to save on a car, so it does make the F-Type very tempting. However, you ought to consider future depreciation; while the F-Type has lost a lot already, it is likely to continue doing so, even if perhaps not to the same extent. The 911, on the other hand, has barely lost any money compared with its new car price. True, it will wilt a little when the new model comes along, but not to the same extent that the F-Type has and will continue to do. So, all things considered, the F-Type makes a worthy runner-up here, due mostly to its raw driving experience and brutish engine; it’s just that it has too many foibles to prevent it from beating the 911. The 911 is expensive, but it’s one of the best used sports cars around, come rain or shine.